Can I Host My Event at UVA? | Conference Services, U.Va. Home / Can I Host My Event at UVA? Does my event meet UVA's educational mission? There must be an educational component to conferences or camps hosted on UVA Grounds by external groups. The program must obtain a sponsor who can vouch that its educational mission aligns with that of the University. Internal programs hosted and administered by University departments are by their nature designed as educational programs, in keeping with UVA’s educational mission. Your need for a sponsor is determined by your organization's affiliation: whether you represent an external organization not affiliated with UVA or an internal UVA department or program. If you are a planner from an outside organization not affiliated with UVA and you wish to host a conference or other program on Grounds using UVA facilities, you must first obtain a University of Virginia (UVA) Sponsor. The Sponsor must be a UVA President, Vice President, Dean, Academic Department Head, Director of Athletics, or one of these individual's designees. The Sponsor must verify that your program adheres to the educational mission of the University of Virginia. The Sponsor will be the liaison between Conferences@UVA and your program in the event of any breaches of University policy. If you represent an outside organization and you do not have a UVA Sponsor as outlined above, you are not eligible to host your event at the University of Virginia. 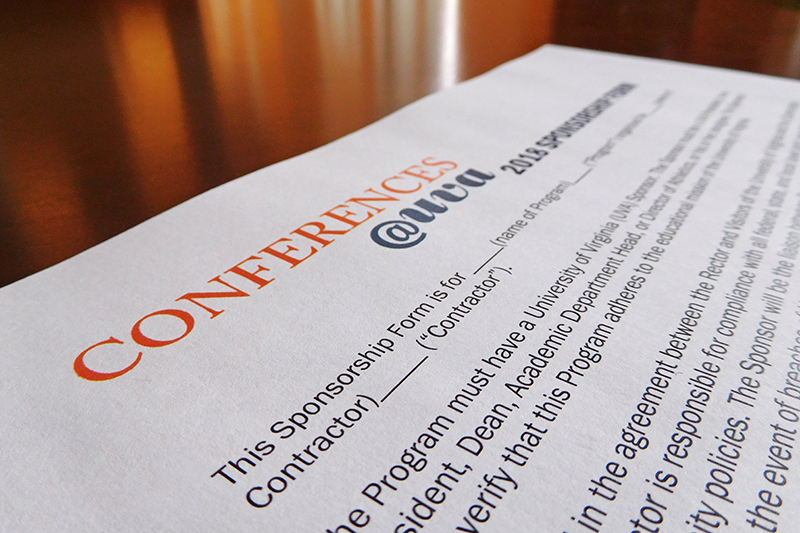 Internal programs conducted by University of Virginia departments do not require a sponsor. The department’s program representative is considered the liaison between Conferences@UVA and the program in the event of any breaches of University policy.